During the week the Sports Quiz took place at Vicarage Road. The club usually try to get a couple of players to come along and, on this occasion, it was Deeney and Mariappa. The former was livid when he didn’t identify all the Premier League players from their pixilated pictures. As I often do on these occasions, I wondered how many premier league clubs would have the captain picking out raffle tickets on such an evening. As we were on the next table, I took the chance to have a chat with the lovely Adrian Mariappa. As usual, I asked about Lloyd Doyley. I knew he was at Hemel now and just wanted to make sure that he was happy. There was a smile and “Lloyd’s always happy”. On Sunday, I left home bright and early and was in the pre-match pub before 11. My party had not yet arrived, but the Norfolk/East Anglian Hornets were out in force, so I was welcomed into their fold, which is always great entertainment. Team news was just the one change for the Hornets with Femenía in for Carrillo, so the starting line-up was Karnezis; Femenía, Prödl, Mariappa, Holebas; Doucouré, Capoue; Janmaat, Pereyra, Richarlison; Deeney. Interestingly, Bachmann filled the goalkeeping spot on the bench leading to a tweet from Gomes that indicated that he was not happy at that decision. Arsenal’s line-up showed six changes from the team that started the Europa League match in midweek and they had more than one substitute with a shirt number in the 60s. I guess Watford are not AC Milan. As we took our seats in the stand, it was notable that there were vast swathes of empty seats in the upper tier of the Emirates. There had been a discussion pre-match about the line-up which indicated that Femenía was playing at right-back. As the team lined up for kick-off, Pete commented ‘Femenía won’ as it became clear that Kiko was playing on the wing and Janmaat had taken up the defensive position. 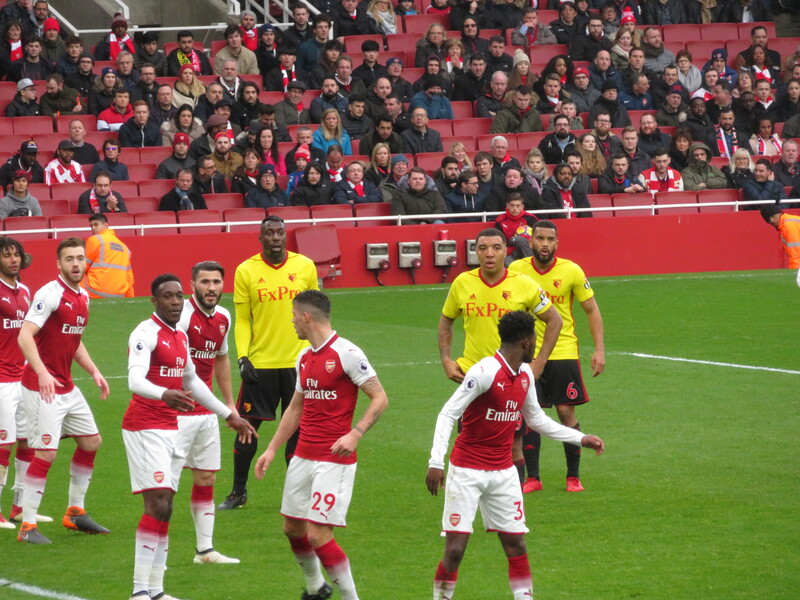 The home side created a very early chance as a lovely passing move finished with Özil setting Aubameyang up to challenge Karnezis, the Watford keeper won that duel saving the shot with his legs. Watford’s first chance came as Pereyra played the ball out to Richarlison whose shot was wide of the near post. Arsenal took the lead in the eighth minute as an Özil free kick was headed home by Mustafi. It was a simple goal and rather frustrating. Watford looked to break back quickly as Pereyra found Richarlison in space but, as so often recently, the youngster hesitated and the space was gone, so he played the ball back to Doucouré whose shot was blocked by the keeper, Cech. At the other end a through ball found Kolašinac whose cross was just too far in front of Aubameyang who could only poke the ball wide of the near post. Watford really should have equalised in the next passage of play as, first, Richarlison hit a free kick that was on target, Cech managed to push it out but only as far as Pereyra who, with the goal gaping, belted the ball high and wide of the target. 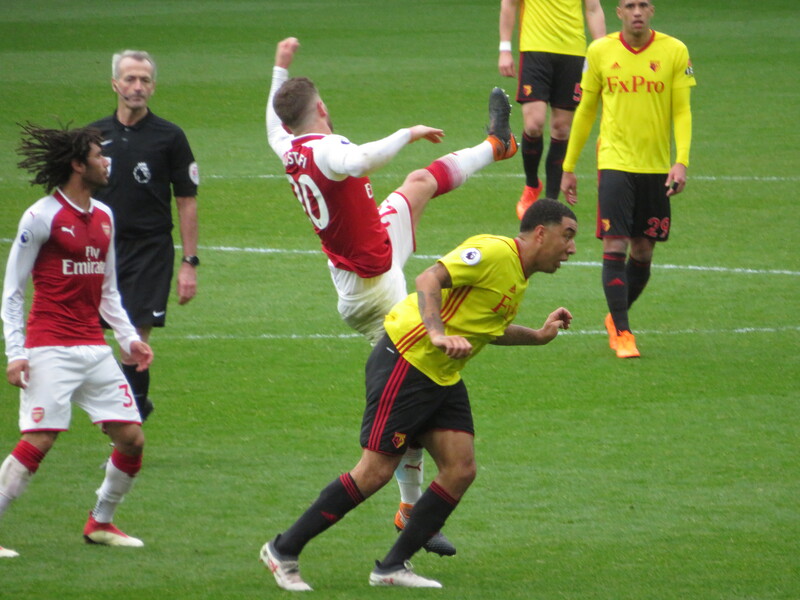 Arsenal could have increased their lead as Özil, who had been a menace all afternoon, was through on goal, but Mariappa managed to put him off and Karnezis was able to block the shot. Nearly half an hour into the game the upper tier was still sparsely populated and the seats behind us were finally occupied by a young couple who were clearly not Watford fans. Very strange as there was plenty of space for them in their own end. The home side had another decent chance to take the lead as Aubameyang got the ball inside the box, but he was denied by a superb tackle from Mariappa. At the other end, Richarlison and Pereyra combined again, this time the young Brazilian was provider playing a through ball to his colleague whose shot was blocked. The visitors threatened again as Capoue found Femenía whose volley was deflected over the target. The Hornets were finishing the half strongly and a decent break finished with a cross from Janmaat that was plucked out of the air by Cech. The last chance of the half came as a lovely cross from Femenía was met by the head of Richarlison, but his effort was pushed around the post by Cech and the half time whistle went with the Hornets still trailing by the early goal. 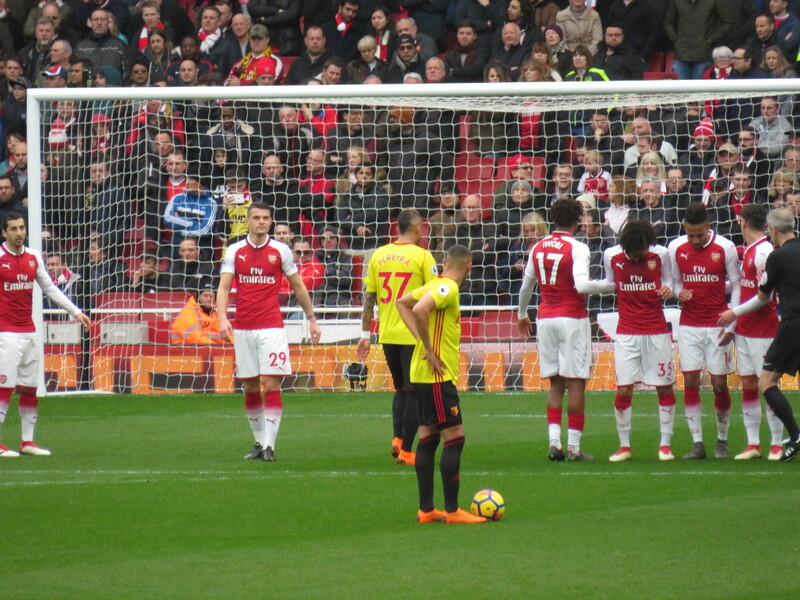 When Watford conceded in the eighth minute, it looked as though it could be a long afternoon but, even though Arsenal had the better of the early exchanges, the Hornets had put in a strong show later in the half and really should have scored. I hoped that we wouldn’t come to regret the missed chances. Arsenal had the first chance of the second half with a shot from distance from Xhaka that Karnezis caught at the second attempt. Watford then had a decent chance as a ball from Doucouré was headed on by Richarlison to Femenía whose volley was blocked. The first caution of the game was earned by Mustafi who stopped Richarlison escaping by tripping him. The Hornets had another decent chance as Capoue dinked the ball to Femenía whose shot was deflected wide. After a bright start to the half by the Hornets, it was frustrating to see the home side increase their lead as Mkhitaryan launched a counter attack before playing a through ball to Aubameyang who rounded Karnezis and scored. 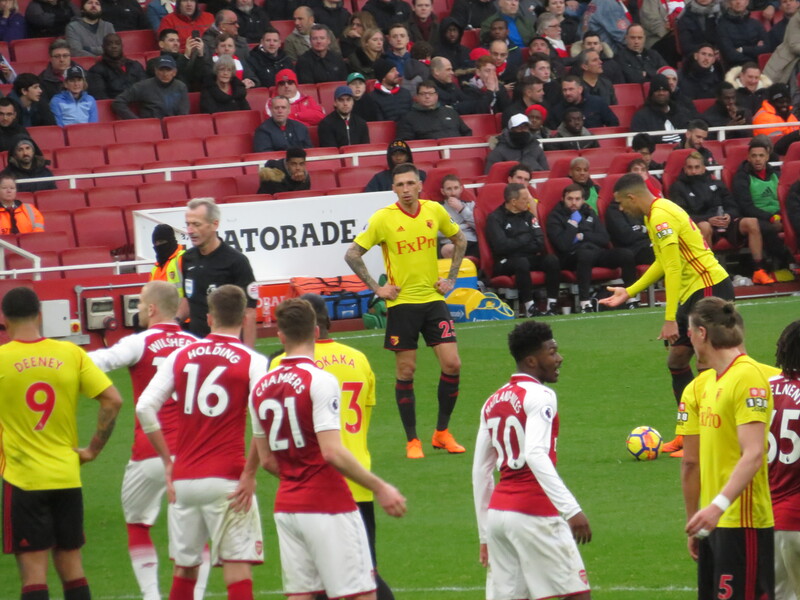 Watford had a chance to pull one back as Pereyra ran into the box and encountered two Arsenal defenders so leapt between them and was adjudged to have been fouled. From our (rather good) vantage point, it appeared to be a very soft penalty. As Deeney stepped up to take it, I had a feeling of dread with the word ‘cohones’ going through my head. The Arsenal fans behind the goal were on their feet jeering trying to put Troy off and, sure enough, Cech went the right way and the shot was at a decent height for the keeper who made his first penalty save for the Gunners. 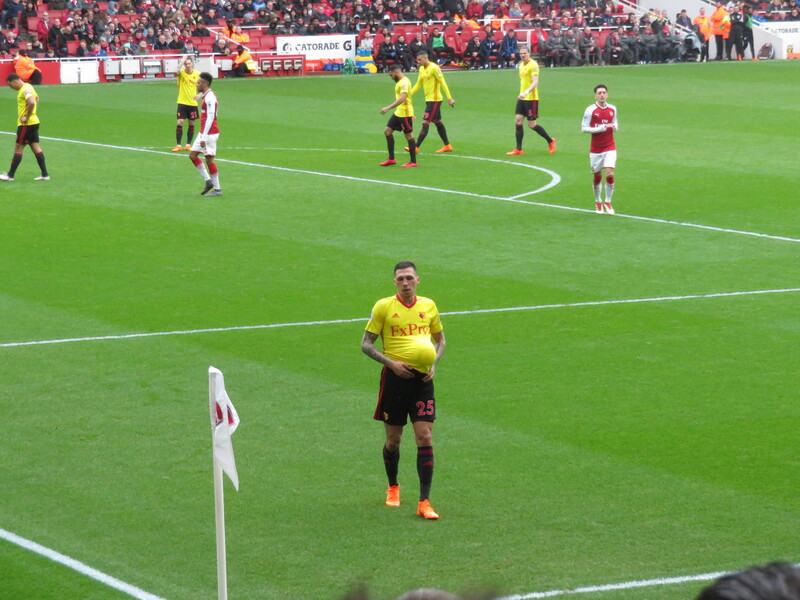 Interestingly Deeney’s miss got a bigger cheer from the home crowd than either of the Arsenal goals that preceded it. While nobody was looking, Gracia made his first change bringing Hughes on for Femenia, who had put in a very impressive performance. Watford could then have conceded a penalty themselves as Mariappa made a rather robust tackle on Mkhitaryan, but the referee gave nothing. Richarlison again had a chance to pull one back for the visitors, but he didn’t take the early shot and was closed down. In the pub before the game, Pete had been talking about the bet that he had laid which required both teams to score and both Deeney and Holebas to be booked. Jose kindly fulfilled his part of that bargain with a foul on Mkhitaryan. There was a substitution for each side at that point as Welbeck came on for Iwobi for the home side and Okaka replaced Pereyra for the visitors. Watford had a great chance to reduce the deficit when a Richarlison cross was knocked on to Janmaat but the shot was poor and cleared the bar. Arsenal then scored a third that was totally undeserved with a shot from distance from Mkhitaryan that bounced off Karnezis, who probably should have done better with it. Holebas then did his best to get sent off with a red mist moment as he charged in to a challenge but, thankfully, was unable to inflict the intended damage, so stayed on the field. Each side made further changes with Chambers and Wilshere replacing Mustafi and Mkhitaryan for Arsenal and Britos coming on for Janmaat for the Hornets. 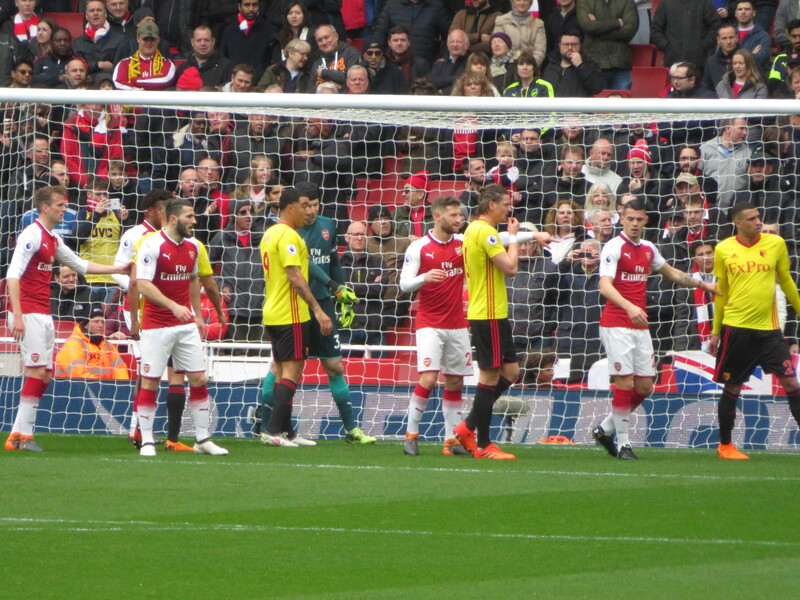 The Arsenal fans finally started a chant and, needless to say, it was to goad the Watford captain with “Deeney, what’s the score?” Watford continued to try to get a goal back as a cross from Mariappa reached Okaka, who stabbed the ball goalwards but it was easy for Cech. At the other end, Karnezis was called into action to block a shot from distance from Welbeck. Richarlison again broke forward, his initial shot was blocked, the ball rebounded back to him but he was closed down before he could finish. The final chance of the game fell to Prödl in a great position, but he belted the ball over the bar. It was that sort of afternoon for the Hornets. It was a rather odd game. Arsenal played better than they had of late and Özil and Aubameyang were a menace all afternoon. But Watford had some great spells of play and a confident Richarlison could have had a hat-trick. If Deeney had scored the penalty at 2-0, it would likely have been a different outcome, but we were left to rue our misses. It didn’t feel like a 3-0 defeat, the score greatly flattered the home side. But, with Bournemouth losing to Tottenham later that afternoon, we finished the weekend in the top half of the table so there were no complaints. With a trip to Liverpool on St Patrick’s day, I am not expecting any points next week, so we can just look forward to our upcoming run of home games and hope that we finish in style. After the disappointing ends to the past couple of seasons, we deserve a decent finish. This entry was posted in Watford FC and tagged Abdoulaye Doucoure, Adrian Mariappa, Ainsley Maitland-Niles, Alex Iwobi, Arsenal FC, Arsene Wenger, Calum Chambers, Danny Welbeck, Daryl Janmaat, Etienne Capoue, Granit Xhaka, Henrikh Mkhitaryan, Jack Wilshere, Javi Gracia, Jose Holebas, Kiko Femenia, Mesut Ozil, Miguel Britos, Mohamed Elneny, Orestis Karnezis, Petr Cech, Pierre-Emerick Aubameyang, Richarlison, Rob Holding, Roberto Pereyra, Sead Kolasinac, Sebastian Prodl, Shkodran Mustafi, Stefano Okaka, Troy Deeney, Watford FC, Will Hughes on March 12, 2018 by franelynn. I’m sad that we lost to arsenal, but it’s not the end of the world,, but Spurs and Chelsea cheered me up.